After a grueling three-year legal battle, Swaziland’s only public interest environmental attorney, Thuli Makama, won a landmark case to include environmental NGO representation in the Swaziland Environment Authority, reinforcing the right to public participation in environmental decision making. Swaziland, a kingdom landlocked in the middle of South Africa and Mozambique, has a population of about 1 million people. While the country has been plagued by food and water shortages, overwhelmed health systems and ever-rising levels of poverty, its reputation as an international destination for big game hunters and wildlife tourists has continued to grow. Because of the unique mountainous geography and populations of iconic African wildlife, game parks and reserves have proliferated. But, in the name of conservation, local people have been increasingly forced off of their traditional lands and persecuted for continuing the hunting and gathering practices necessary for their survival. Rural poverty-stricken communities depend heavily on the environment for their most basic needs. The environment is an integral part of their lives, historically providing building materials, medicinal plants, food and firewood. Indigenous knowledge and practices are centered on ensuring the conservation of these resources for future generations. However, communities are increasingly forced to compete with commercial interests for access to these environmental resources. When the Swaziland Environment Authority Act was first passed in 1992, serious consideration was given to public participation in decisions that will affect the environment. In 2002, when this act was amended, the spirit of public participation was strengthened with a specific provision that the Swaziland Environment Authority management board must include one representative of an environmental NGO. However, the first minister of environment charged with carrying out this provision decided to exclude NGOs and go against the law. Despite pressure from Makama and her organization, Yonge Nawe Environmental Action Group, the minister refused to comply with the law. Faced with the troubling possibility that this defiance could become a precedent for future ministers, Makama and her organization decided to challenge the minister’s actions in Swaziland’s highest court. In April 2009, three years into the lawsuit, the High Court of Swaziland agreed with Makama and ruled that the Management Board of the Swaziland Environment Authority, as appointed by the minister of environment, was illegally constituted. The court’s ruling ensures that environmental groups will now have a place on the Management Board, where they will be able to monitor the actions of the Environment Authority and include the legitimate perspective of the environmental justice movement in their deliberations. The positive high court ruling provided hope for local communities neighboring privately owned game reserves that their struggles may finally be recognized by the proper authorities. For many years, these communities have endured brutality and abuse at the hands of armed reserve owners, and a number of suspected poachers have been killed in the name of conserving the fenced-in wildlife. While there is growing consensus internationally that the world’s remaining wildlife will not survive unless local people are given a stake in preserving them, Swaziland’s conservation policies have yet to incorporate these communities into the process. Currently, important game protection laws are administered not by a government ministry, but by a private company, Big Game Parks (BGP), which owns and operates several game reserves and manages one of Swaziland’s national parks. In 1997, Swaziland’s king, who holds absolute power, took administrative control of the Game Act, and amended it to allow BGP and its employees to serve as game rangers with immunity from prosecution for their actions so long as they are “protecting game.” Over time, BGP has gradually taken charge of all enforcement of the Game Act. The company is not accountable to any government entity, but consistently claims to act with authorization from the king. Near the edges of the protected areas, extremely poor communities eke out a meager existence through a combination of food aid and foraging. Many people lived off of the land for generations before being evicted without proper compensation when BGP took over management of the conservation areas. 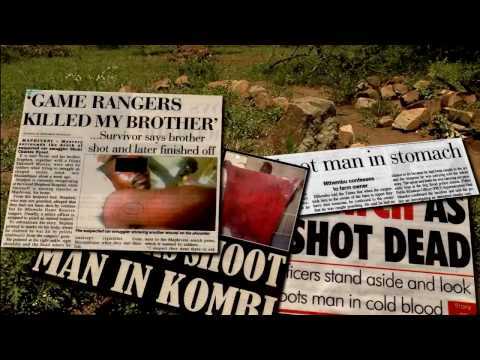 The 1997 amendments to the Game Act brought with them an increase in the number of people shot and killed or maimed for suspected poaching, yet game rangers have not been subject to due process of law because of BGP’s connection to the king. This has led to fear among the local communities neighboring game reserves. The mere mention of the king’s name is enough to silence the communities because of the reverence and respect that Swazis hold for the king. Some of the better known cases of abuse have taken place in the Nhlantambita community. Because the people there were left with no legal way to feed their families when they were forced from their land, some resorted to illegal hunting in order to survive. In August 2008, a young man named Musa Gamedze was accused of poaching and was shot and killed in front of his family and young children. While the Swazi Weekend Observer reported that police officers and a “game ranger” were involved in the killing, it is alleged that the son of BGP owner Ted Reilly was involved in the incident. To date no arrests have been made. When Makama first visited these communities in 2004, she was struck by the desperation and hopelessness she encountered. The people, mostly uneducated, had no political power to speak out against BGP, and many feared retribution if they came forward with any allegations. The communities put their trust in Makama, and she felt that she could not turn her back on such injustice. Now, Makama and her organization are representing local peoples in court against BGP. Makama is also calling for investigations into the acts of violence committed by BGP rangers and is attempting to get the courts to examine and declare as unconstitutional the part of the Game Act that shelters staff of this private company from prosecution. This continues to be a long process, with her first papers filed before the court more than four years ago. A hearing date has yet to be scheduled for this case. Makama’s success in challenging malpractices in environmental management is a huge step forward in the struggle to include local people in conservation efforts in Swaziland. However, it has not been without its price. Makama and her staff members have been threatened and harassed for their advocacy on behalf of local communities. In response to public calls for the arrest of Musa Gamedze’s killer, BGP sponsored full-page advertisements in the local newspapers attacking Yonge Nawe, Makama and her family. Thuli Makama, receiving her award at the 2010 Goldman Prize ceremony. Thuli Makama, accepting her award at the 2010 Goldman Prize ceremony. 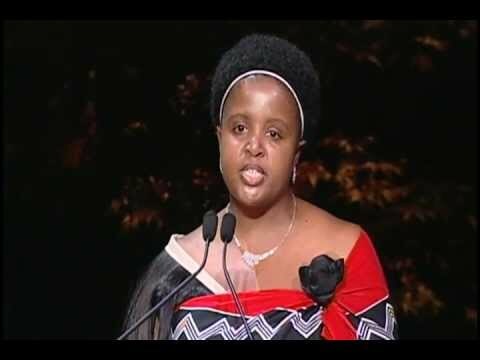 Thuli Makama, 2010 Goldman Prize winner for Swaziland.